It’s easy to get inundated with social media and after 4 hours lie to yourself that you have actually been working. This is why I prefer to spend my time on LinkedIn. 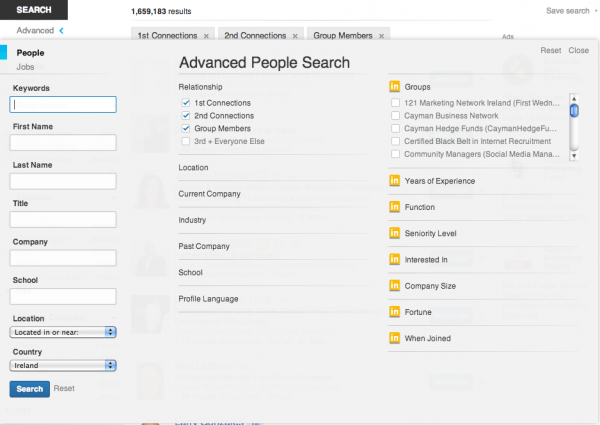 Instead of getting sucked into other “social” networks, Linked-In was built for business. The best part is that B2B marketers all report significantly higher conversion rates with Linked-In versus other social networks. 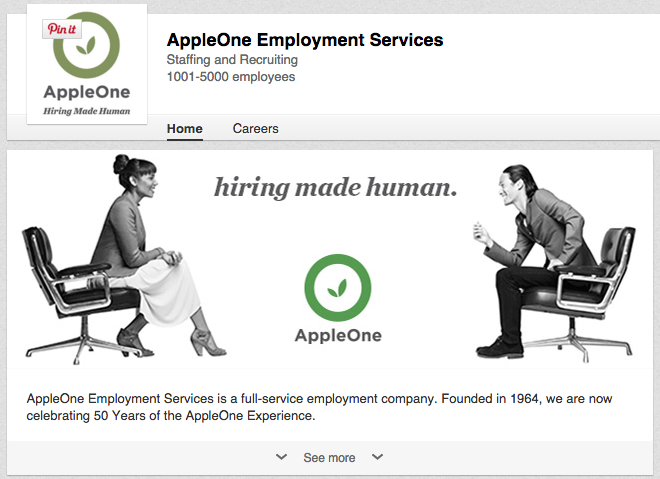 ApploeOne is doing a lot of great things with their Linked-In profile. They have invested in the design and copyrighting so the image and content tells the reader what the company does in a very short time-period. If your employees are connected on LinkedIn you will generate a significant amount of traffic if they are active on the platform. The key here is to get as targeted as you can. Most salespeople have geographic parameters. However, there are other parameters that can help. For instance, I am active in a Commercial Bankers Group. I wanted to know who in this group specializes in Commercial Real Estate and is based in the United States. You can see that there are 5,240 people who are involved in commercial real estate and also in this group. LinkedIn allows you to save three advanced searches before they want you to pay to be a premium member. I am a moderator in several Linked-In Groups which also gives me a big advantage when contacting prospects. From my experience most people set-up Linked-In Groups wrong. For instance, let’s say you sell automation technology for manufacturing companies in the Mid-West. Most salespeople and marketers would set-up a Linked-In Group Titled: Automation Technologies Group. I would be highly selective in who I let in the group. I would also send out a mass email and mass physical letter head announcing the group. After a couple of months of filling the group with valuable information would I start to selectively prospect to members of the group. The best part about groups and your actual connections is you can export this list to an excel file and get the names, company data and emails from the members of the people in this group. This is great when you need to do an email blast or do a mass mailing. You can also do email blast to members of your group from LinkedIn which has some very obvious advantages to you as a marketer and salesperson. You can’t just sign-up for LinkedIn and expect money to fall from the sky. You also have to publish updates and even write articles to increase engagement. Michaela Alexis is the prototypical LinkedIn Connector. She wrote a detailed story on how she landed her dream job in 2 weeks using Linked-In. This story has been read by over 140K people and been shared over 1,000 times! She started off like most people with no significant following. However, by publishing interesting content she now has over 27K followers! This proves you can create a brand here on Linked-In! Like any social network you need to see what is getting shared by the most popular people. This shows what types of content people are interested in. Below are some influencers to follow if you are interested in there areas of expertise. We mentioned her background in the section above so I want repeat her background. I’m very impressed with how she routinely produces amazing content. James Altucher is about as unconventional as LinkedIn Influencer’s come. He’s a successful entrepreneur, chess master, venture capitalist, and author of many books including, The Power of No. Altucher looks for the most painful and embarrassing situations in his life, then writes about them. Gretchen Rubin is the author of several books, but she’s best known for her New York Times bestselling book, The Happiness Project. She’s emerged as one of the most influential speakers and writers on the topics of habits and happiness. In addition, she’s a prolific writer on LinkedIn, publishing several Pulse articles a week. If you’re striving to feel better at work or home, Rubin is a must-follow. I highly recommend you start engaging on Linked-In to build a following and leads for your company. If you have any questions feel free to call or email us.